The Carrot helps us explore the psychic meadow of our potential tomorrows, to understand the transcendental burrow that is the foundation of our possibilities, to sniff the preternatural winds for hints of what may come. This describes the three basic readings of the Carrot Cards. 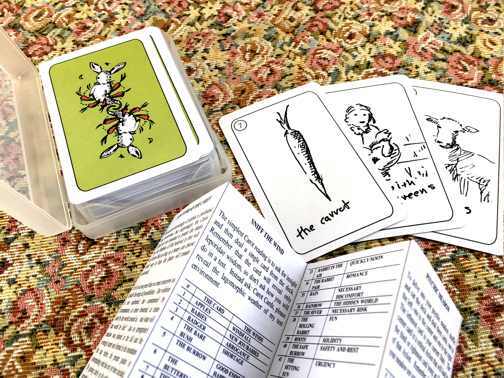 The ancient knowledge of rabbits is profound and mysterious, but, surprisingly, the Carrot Cards are not intended to predict the future. No, the Rabbits of Old believed in free will and knew that as long as a bunny can choose which way to hop, the future will remain undecided. Yet it is at our peril that we treat tomorrow as equally favoring all possibilities. Our volition is not unlimited, but constrained by circumstances, at times thwarted, at times aided by the world around us. And what will that world be like? Just as springtime's meadow was planted in the fall and the evening's storm was formed in the mountains the day before, the present guides us in contemplating what has not yet been decided. By gaining clarity on the subtle clues of the metaphysical landscape around us, we will be quicker and surer in our travels toward our goals. (note: the Carrot is not a Tarot deck, but in the tradition of fortunetelling Oracle decks) Thanks Aeclectic Tarot.